• How long have you been dying yarn? I started dyeing yarn in 2008 with a kit my Dad gave me from Hello Yarn. I was in between jobs and looking for something to do. • What is your background? I studied Environmental Studies at Oberlin College and Environmental Law from Vermont Law School. My parents are both artists - my father is a semi-retired graphic artist and my mother is a folk painter and children's book author. • Do you have any special experience with art or science that influences your dying? My parents both work with very dramatic color palettes - it's taken some time for me to come around to it, but this works great for socks! • What makes your yarn special or unique? I mix a large percentage of my own colors. 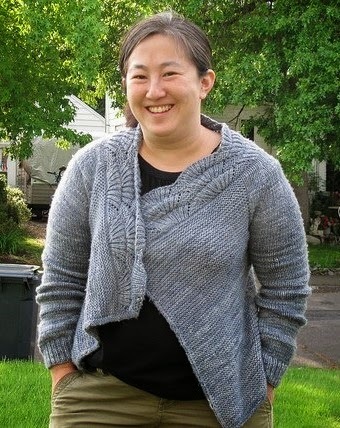 It's kettle dyed without added soaps and salts that would make the color go on more smoothly. Sometimes I put the yarn in a second time if it's still got overly high contrast spots. It's a personal judgment call. 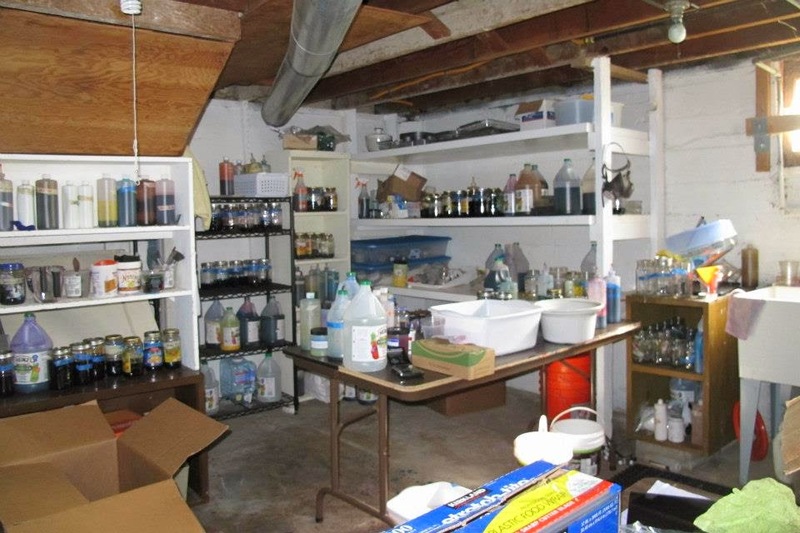 • What is something interesting about your dying process that non-dyers might not know? 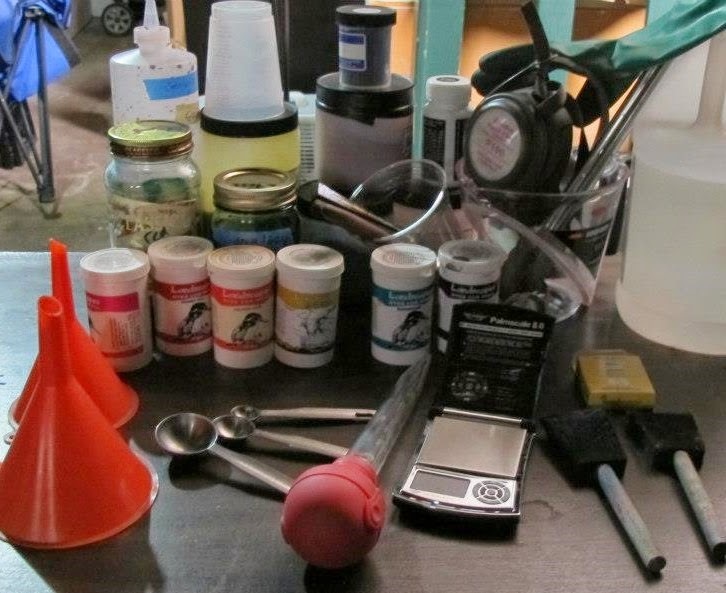 Here's the whole process: I mix dye into solutions. I mix the solutions into colorways and add acid (sometimes the acid is hand mixed too). I add at least one tie to every skein by hand. I work in batches of two skeins at a time, although I run up to four pots at a time. All winding is done on a small 3-skein at a time winder - that means I can run maybe 9-12 skeins in a hour through the winder, but any tangles are fixed by hand. 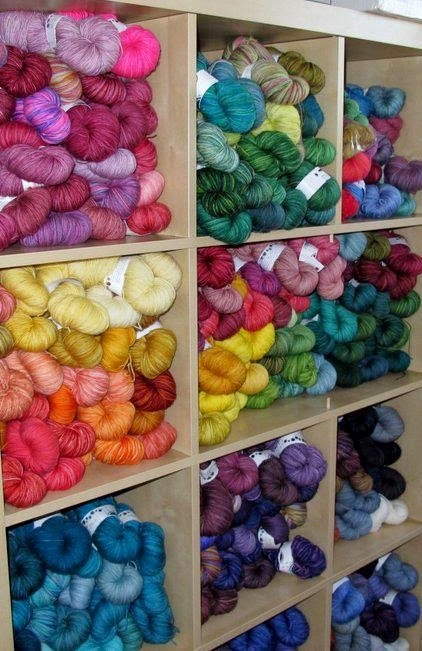 Then the yarn has to be packaged, sorted, stored and mailed. 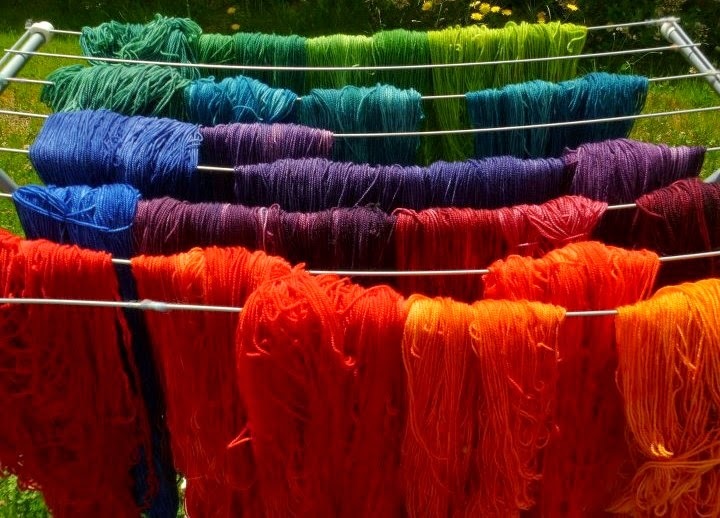 • What are some other factors impact the cost of hand dyed yarns? 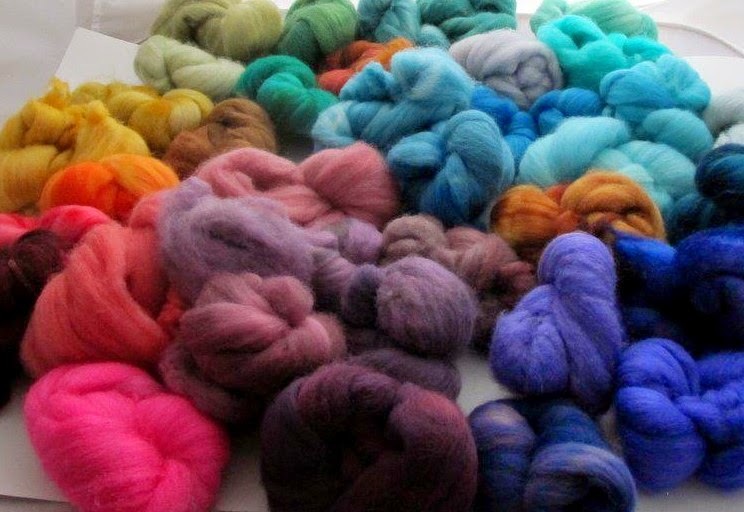 You'll see a different range of prices depending on whether the yarn dyer is able to 1) buy from a mill directly 2) sells on-line or wholesales exclusively or does a mix. Some of the money goes to advertising as well and that includes promotions. I'm working on creating a west coast farm based product - that will cost a lot more, because I'll be paying retail for the fleece and having it milled for me. Look for it in 2015. Most commercial yarns travel a lot - sometimes a sheep will be sheared in one country, then processed in another, then sent to yet another for dyeing before hitting a distributor and then getting to your local yarn shop. • How do you choose your colors and name your yarns? 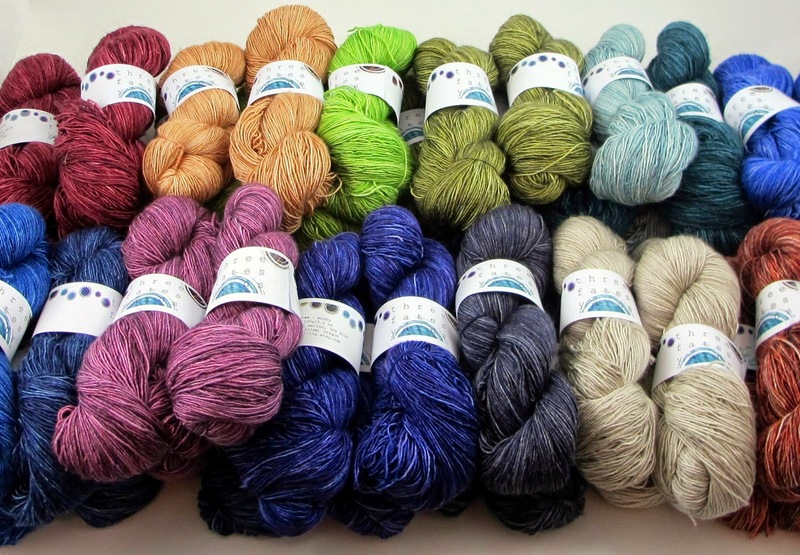 Three Fates Yarns is all about story telling and has kind of an elemental theme, so the individual yarn names have been named after greek and roman mythological elements. E.g. Terra Sock - Earth, Helios - Sun, Aether - Wind, Aquae - Water, etc. • Where do you find inspiration? Wherever and whenever. • How many colorways do you have? Over 30. I lose count from time to time. I know I'm dyeing at least 30 of them consistently. Sometimes a colorway will loose it's way and come back. TI am dyeing 18 different yarns actively, although there is usually only demand for five of them. Terra, Eponymous, Aether, Aquae, Helios. MCN seems to have gone out of fashion. • Do you create seasonal or special order colors? I don't really do a seasonal rotation, although that may come in time. I take special orders on a case by case basis. • How many and what types of bases do you use? • Where do your yarn bases come from? • What are your favorite colors? It used to be blue. I'm never sure anymore. • Favorite fibers? Blue face Leicester. • Do you crochet, knit, or spin? What came first?Knitting and crochet. I don't know which order. Spinning came much much later. • Anything else you would like to share? I dye yarn AND fiber.